DbViewSharp is intended to make it easy to find the information you are looking for in a database without resorting to SQL all the time. It improves SQL Server Management Studio (SSMS) in four ways: faster to load and navigate around, no tree controls, searching is generally on partial text match and always case insensitive, smart search function makes for very convenient searching of table data, and on connecting to a database it displays an explorer-like grid of the database table names together with row counts, creation, and update dates. This is a portable tool, hence no installation is required. 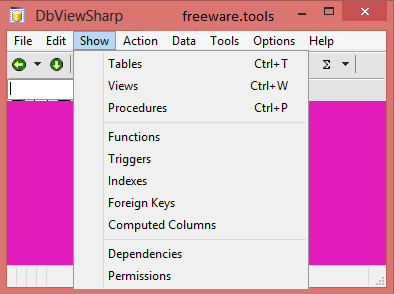 This is the portable counterpart of DbViewSharp, an advanced software utility that permits users to easily connect to, explore and manage SQL databases. Since there is no installation involved, you can extract the archive files to any part of the hard disk and just click the executable to launch the tool. There is also the option to save Portable DbViewSharp to a USB flash drive or similar removable storage unit, in order to run it on any PC with minimum effort and no previous installers. Worth mentioning is that, unlike most installers, Portable DbViewSharp leaves the Windows registry untouched, so it does not increase the risk of OS stability issues. The GUI is pretty classical, represented by a normal frame with options accessible in the menu bar. In the initial phase it is necessary to input data to connect to an SQL database, such as user ID and password. The connection can be tested before actually establishing it to rule out any glitches, as well as duplicated (cloned) by copying its details to a new connection. Multiple connections can be made and easily switched through. When it comes to SQL database contents, you can view tables, views, procedures, functions, triggers, indexes, foreign keys, computed columns, dependencies and permissions. In addition, you can search and refresh the grid, view history, modify the data view, and so on. The tool has a good response time and runs on low CPU and RAM, so it shouldn't put a strain on computer performance. All in all, Portable DbViewSharp provides users with a straightforward method and handy options for connecting, investigating and managing SQL databases.